Did you know you get 1 free night each year you’re a Chase Marriott Rewards Premier cardmember to use at any Marriott Category 1 to 5 hotel? You can use the free night anywhere in the world, including amazing hotels in the Caribbean & Mexico! 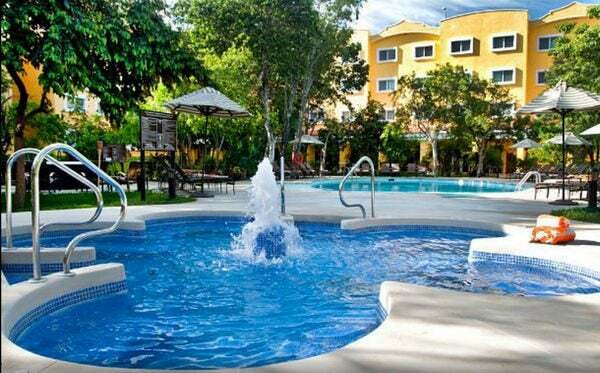 Get a Free Night in Santo Domingo, Dominican Republic, Worth Nearly ~$234! 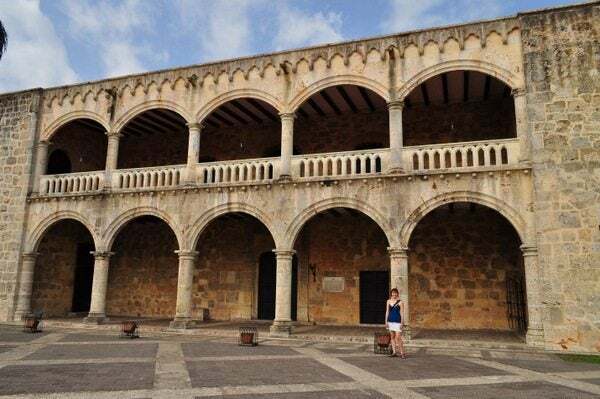 Emily Loved Visiting the City’s Zona Colonial! I’ll show you 5 top hotels in the Caribbean & Mexico where you can use your free night to get Big Travel with Small Money! When you sign-up for the Chase Marriott Rewards Premier card, you’ll earn 80,000 Marriott points after spending $3,000 in the 1st 3 months of opening your account. 1 free night at a Marriott Category 1 to 5 location on your card anniversary. It expires 12 months from the issue date. Because it’s a Visa Signature card, you’ll be eligible for Visa discounts and a 6-month membership to CLEAR. There’s an $85 annual fee that’s NOT waived for the 1st year. But it could be worth paying depending on how you use the free night. Note: There are rumors that Chase will make it tougher to be approved for ANY of their cards (including airline & hotel cards) if you’ve opened ~5+ credit card accounts with any bank within the past 24 months. So I recommend folks 1st sign-up for the Chase Sapphire Preferred. Here’s why. But if you already have the Chase Sapphire Preferred or don’t want it, consider this offer for the Chase Marriott Premier. Or the other Chase cards in Hot Deals. Marriott added new features to their loyalty program this year, including points advances and the capability to share your points. And later this year, they’ll merge with Starwood. Remember, you’ll get the 5th night free on any award stay when you redeem your Marriott points! So if you want to stay longer, it’s an excellent way to save 20% on your vacation. 80,000 Marriott Points Is Enough for Several Nights at Lower Category Marriott Hotels. Or 1 or 2 Nights at the Nicest Marriotts! I like using Hotel Hustle to find hotels for award stays because it shows you how many points you’ll need for your specific travel dates. And show you if award nights are available at hotels, including Marriott! Another option is AwardMapper. It shows similar information. But it’s not specific to travel dates and won’t search for available award rooms. I’ve written about how to use the signup bonus to get Big Travel with the Chase Marriott Rewards Premier card. You’ll also get a free anniversary night from the Marriott Rewards Premier card to use at any Category 1 to 5 hotel. For instance, the Courtyard Port of Spain in Trinidad and Tobago is a Category 5 hotel. It costs 25,000 Marriott Rewards points or ~$192 a night. Select the hotel and your room type and make sure it is a Category 5 or less. On the reservation page you will see that you’ll have the option to use your free night certificate. Just click through as you normally would to book your hotel for free! Here are my top 5 picks on where to use the free night in the Caribbean & Mexico. I haven’t personally stayed in all of these hotels, but they look like great deals! The rates are based on availability in June 2016. Just remember, rates can vary depending on the season! The Courtyard Cancun Airport hotel is located just 3 miles from the airport and only 15 minutes from the beach. And there’s a free airport shuttle. This hotel might be a good pick if you want to be away from the loud party atmosphere of the main drag. Or, for your 1st or last night in Cancun. Points & miles hobbyists will sometimes switch hotels at their destinations to avoid paying cash. 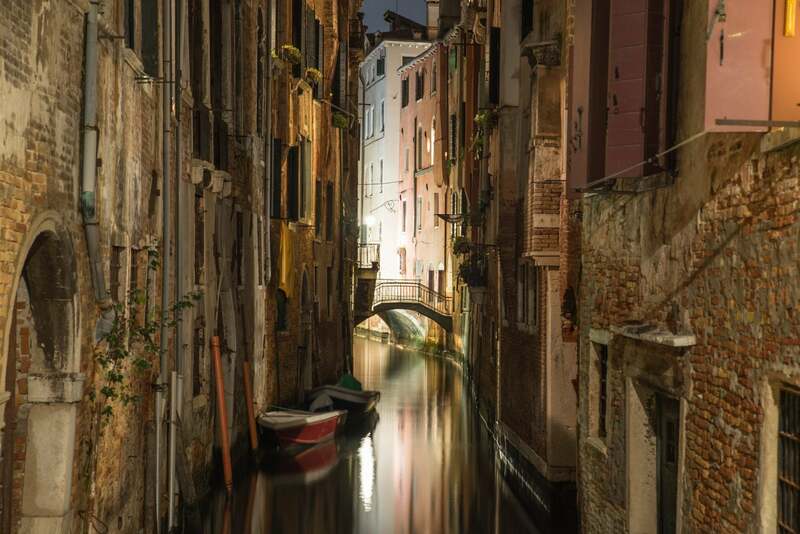 So, you might stay here for 1 night if your flight arrives late at night. Then move to another hotel for the rest of your vacation. The Courtyard Cancun Airport Is in a Very Convenient Location! Many people also fly in and out of Cancun to explore other sites around Mexico. There’s tons to do in the area like visiting nearby Mayan ruins or diving in the Riviera Maya! Folks on TripAdvisor give this hotel consistently good reviews. They love the location and free airport shuttle. And many suggest staying here if your flight arrives late at night or leaves early in the morning. 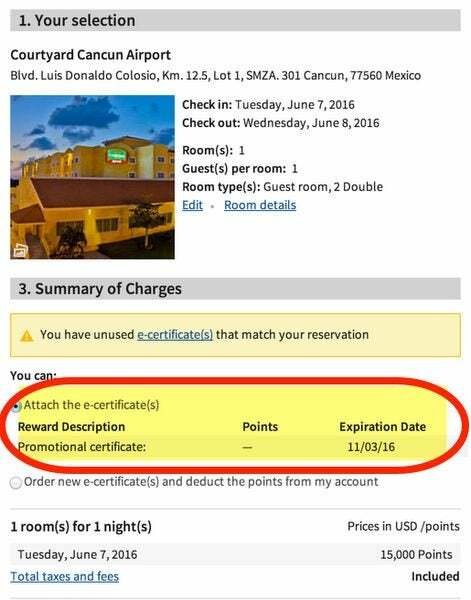 Nights here in June 2016 cost ~$171 or 15,000 Marriott Rewards points. You’re saving money by using your free night here! The recently renovated Renaissance Santo Domingo Jaragua Hotel & Casino gets terrific reviews on TripAdvisor for its top-notch service, beautiful rooms & grounds, and ocean view. 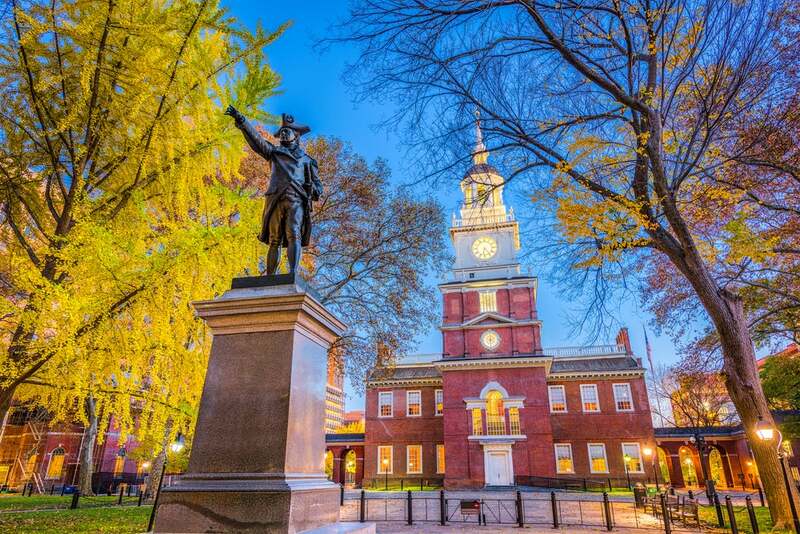 Located near the historic Colonial Zone, this Category 3 hotel costs 15,000 Marriott Rewards points per night. Rooms in June 2016 are ~$234 a night. That’s a good deal in exchange for paying an $85 annual fee on the Chase Marriott Rewards Premier card! Emily celebrated her 30th birthday in the Dominican Republic with 1 of her best friends. Check out their trip to Santo Domingo here! Puerto Rico is another top pick for travelers in the Caribbean. 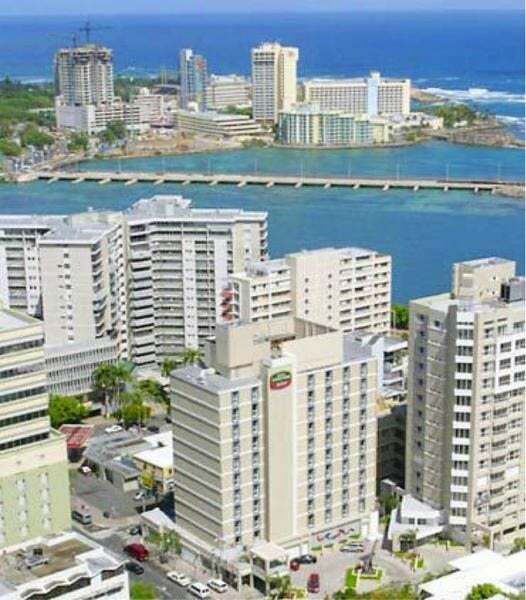 If you’re looking for a convenient spot to use your free night in San Juan, Puerto Rico, the Courtyard San Juan Miramar is a good choice! This hotel gets 4 stars on TripAdvisor because of the friendly staff and good location! It’s not downtown, but there’s easy access to many of San Juan’s popular attractions, like Old San Juan and Condado Beach. Rooms at this Category 5 hotel are usually 25,000 Marriott Rewards points or ~$170 in June 2016. Note there’s also a 9% daily resort fee. 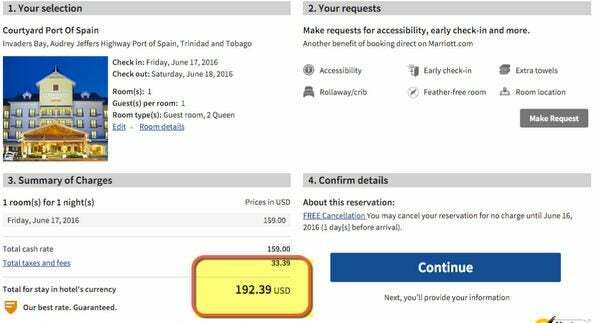 Resort fees are common for hotels in the Caribbean, so be sure to look for them! If you don’t plan on taking advantage of the amenities you can ask if they’ll reduce the charge. Bridgetown is the UNESCO World Heritage capital of Barbados. The Courtyard Bridgetown is just 20 minutes from the airport and is walking distance to beaches and restaurants! 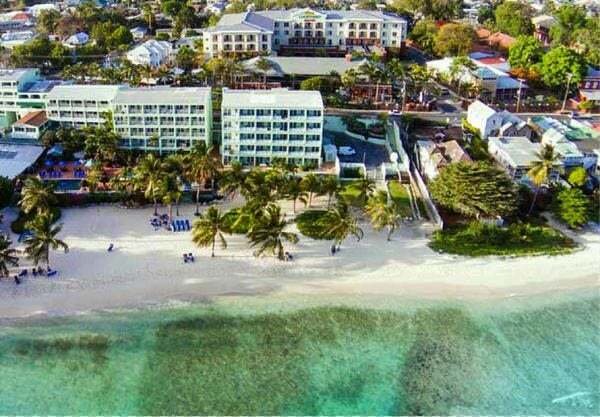 The Courtyard Bridgetown Is Located Across From Coconut Beach. Your Stay Includes Beach Towels and Chairs! Folks on TripAdvisor give this hotel almost all 5 star reviews. I found rooms at this Category 5 hotel for either 25,000 Marriott Rewards points or ~$159 a night in June 2016. A free night at a hotel near the beach is a great deal! Travelers flock to Curacao, an island in the Caribbean, for its great beaches, culture, and diving. Willemstad is the country’s capital and a popular spot to visit. 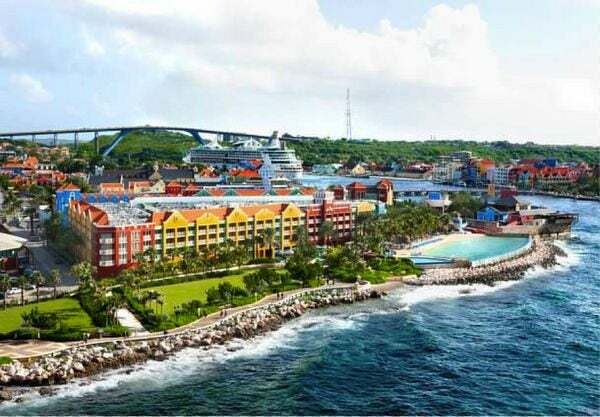 The Renaissance Curacao Is in the Country’s Capital, Willemstad. It’s a UNESCO World Heritage City! Renaissance hotels are 1 of Marriott’s upscale brands. I found rooms at the Renaissance Curacao Resort & Casino in June 2016 for ~$185 or 25,000 Marriott Rewards points per night. Folks on TripAdvisor give the Renaissance Curacao almost all 5 star reviews. They love the convenient location…especially if you’re there for Carnival! Using your free night award here could save you ~$100! The Chase Marriott Rewards Premier card gives you 1 free night at any Marriott Category 1 to 5 location on your card anniversary. You can get a free night at a hotel that’s worth hundreds of dollars. So it can be worth paying the $85 annual fee depending on how you use this perk! You’ll also earn 80,000 Marriott points when you spend $3,000 on purchases within the 1st 3 months of opening the Chase Marriott Premier card. Plus you’ll earn 7,500 bonus Marriott points when you add an authorized user who makes a purchase within same 3 month timeframe. There are lots of amazing Marriott hotels in the Caribbean and Mexico where you can get award stays. Let me know your favorite Marriott hotels in the Caribbean and Mexico! @Paul – Interesting points. Thanks for sharing your experience. @ff_lover – I’m sorry to hear you had a bad experience there! Thanks for sharing. I stayed in Marriott Courtyard Cancun. It is almost a dump! During Spring Break the pool was not working and full of leaves, the spa was closed, the floors/rooms smell mold (they were running fans in the hallway), front desk not very helpful. Chase misleads consumers about the value of the free night stay anniversary stay, In promotional materials about the anniversary offer Chase shows select Marriott properties that all are level six or higher except one property. Clearly deceptive. While every year they devalue Marriott Rewards points by raising levels of desirable locations. We stayed at the Courtyard Port of Spain paid $70 night and will never go back. Suggest the Hyatt in Port of Spain. Staying at the Courtyard at Cancun Airport guess is OK if you a student spring breaker with a car. Taking your family to Cancun staying in a business area where it would cost $40 for a taxi one way to the beach does not make sense. This hotel is a convenient location to the airport and to the entrance to downtown yet not to vacationers. Bottom line most level five hotels you can book a night for $85 the same amount as the Chase Card annual fee. Not much value here..
9:13 amApril 11, 2016 Mark P.
Yes, the JW Marriott increased categories recently, so is no longer a free night with the credit card. A great alternative is the Renaissance Jaragua in Santo Domingo, which I believe is a Category 4 or 5 but is actually in a better location than the JW Marriott. Closer to the Colonial Zone, right on the water, and a more resort-like feeling than the JW Marriott which is in downtown Santo Domingo, a place most tourists are not interested in going.